Mitsubishi due to some reasons discontinued its Lancer Evolution for a few years but with the unveil of its all new Mitsubishi Lancer Evolution MR 2015 it looks like the company is looking ahead to get back its old pages. Loaded with new features Mitsubishi Lancer Evolution MR 2015 is powered by an engine that delivers sufficient power and torque to satisfy the big guys. 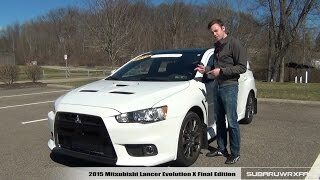 Let us have a close review of the all new Mitsubishi Lancer Evolution MR 2015. The interior of Mitsubishi Lancer Evolution MR 2015 is finished with Recaro bucket seats, which includes two in the front and a bench for three at back. Built in with cruise, audio and phone controls the three-spoke steering wheel adds to its corporate interior look while narrow center console in also a unique feature to the interior. Talking about the technological upgrades a 6.1 inch touchscreen audio display featuring FUSE Hands-free Link System with USB port, power windows and door locks, silver bezels over high-contrast instruments and a LCD color multi-information display with newly introduced safety features like Cruise Control and Automatic Climate Control. Exterior of Mitsubishi Lancer Evolution MR 2015 is classy like always. The full frame grille amidst the pinched headlamps looks stunning with its new design. With its wide looks the fenders get a pretty huge design. Headlights come with auto-off function while the tiny round fog lamps has enough power to park their presence. Hood and front fenders get aluminum work adding to lighter weight durable finish. Moving towards the rear of Mitsubishi Lancer Evolution MR 2015 you’ll notice clear and black taillights adding to aggressive looks while beneath them is a rear diffuser with dual exhaust outlet which is also a reworked piece. The luxurious sporty look of Mitsubishi Lancer Evolution MR 2015 gets an additional star through its 18*8.5 inch BBS forged alloy wheels. Mitsubishi Lancer Evolution MR 2015 gets its power through a 2.0 Liter turbocharged engine delivering total output of 291 hp and peak torque of 407 nm mated to six-speed TC-SST transmission. Mitsubishi Lancer Evolution MR 2015 top speed touches a 146 mph mark while the 0-60 mph sprint takes 4.5 seconds to finish.